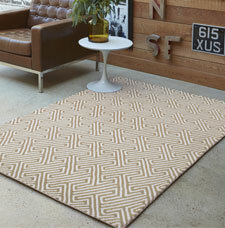 Maisy Medina is a collection of flat-woven handmade modern rugs. The collection is split into two designs; Maisey and Medina. The Maisey rugs are made of 100% Wool while the Medina designs is made of bamboo silk; both are soft and feel great to the touch. Furthermore the rugs are offered at great value for money. Fabric: 100% Wool. - 100% Bamboo Silk.